There aren't many traditional French dishes which are as easily veganisable as pissaladière. This strangely named tart originates in Nice and its area, and is essentially a tomato-less onion pizza. Take it on a picnic, make it for an apéro, have it for lunch, do whatever you like with it. The traditional version uses anchovies, but this vegan pissaladière is capers all the way. And no, I don't make my own pastry. My pastry is bad, bought pastry is good. 1. Slice your onions. Put them in a large frying pan with the oil, thyme, sugar, salt, and pepper. Cook over a very low heat for 45 minutes to an hour, stirring often. You want to create a kind of onion mulch, not caramelised onions. 2. Roll out your pastry onto a greased baking tray. Bake blind for about 10 minutes. 3. 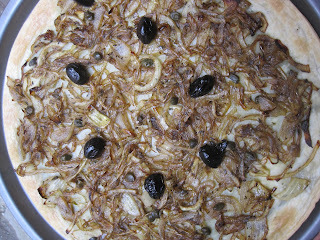 Just before the onions are cooked, stir in the capers and the small splash of vinegar. 4. Allow the onion mix to cool slightly before heaping it on to the pastry. Dot with olives. Return to oven for 15 minutes at 180°, or until the onions are starting to brown. If you look closely, it looks like you're eating worm pizza. Yum. Le Potager du Marais is a nice little organic restaurant serving traditional French food, adapted for vegetarians. The entire menu is vegetarian, and a good deal of it vegan, including a very wide choice of vegan desserts. The staff are friendly, and the food is mostly very good. 1. Le Potager feels very French, and that's what most visitors want from their stay in Paris. It's quaint, and there are lots of recognisably French dishes on the menu (the onion soup starter, for example, which I'm told is excellent but isn't vegan). 2. The restaurant's super practical central location, in the Marais as the name would suggest. It's a stone's throw from the Pompidou Centre (or, as it's known in Paris, 'Beaubourg'). There are plenty of nice bars in the area for an apéro before or digestif after. 3. Le Potager caters really well to most dietary requirements. People who are terrified of vegan food can go for something with cheese in it. Everybody loves cheese, after all. Ahem. It's also great for anyone with a gluten intolerance. The restaurant offers gluten-free bread, and they will happily replace 'normal' bread with its gluten-free equivalent in dishes such as the French onion soup mentioned above. Helpfully, and extremely unusually for Paris, both the vegan options and the gluten-free options are clearly marked on the menu. To the food itself. Le Potager serves what might be my favourite restaurant starter in the city: their tartare d'algues. I can be a bit funny about seaweed, sometimes finding it too fishy, but this is a delight. A variety of very finely chopped seaweeds, mixed (I think) with capers and shallots and bound with olive oil and maybe some lemon juice. You can buy little pots of tartare d'algues very expensively at organic shops, but Le Potager's version somehow tastes more special. Being so French, Le Potager of course provides lots of very good bread to help you scoop up your tartare. Oh, and the mushroom pâté starter is really good too. There are some treats in the main courses part of the menu too. The nut roast doodah comes with a sublime mushroom duxelles that I can't get enough of. The croustillants are good too: a sort of fat burger made with quinoa and other tasty, healthy things. My only real qualms about the main courses are that: a) many of them come with similar, slightly insipid and often slightly cold vegetable purées on the side. The broccoli one is kind of bitter and to be avoided. And b) the chilli just isn't very good. It tastes almost exclusively of cumin. That said, the sautéed potatoes that come with some dishes are delicious. Most main dishes also come with a salad on the side, like the beetroot and carrot one you can see above, sometimes with nice small sprouts. Oil and vinegar are provided separately, so you can dress your salad to your own taste. Le Potager has lots of vegan desserts. I once ate a truly fantastic pear and chocolate cake here, and a very respectable tarte tatin. I'd avoid the carrot/orange flan thing though - too much agar agar or something: it doesn't quite work for me. There's a good choice of wines. For €25, you can have three courses. Some of my favourite dishes aren't available as part of this menu though. Funny, that. I tend to go à la carte and skip pudding, because I don't have much of a sweet tooth.